A view of the Loenfjord that everyone should get a chance to see in their lifetime. Jay Fleming photos. 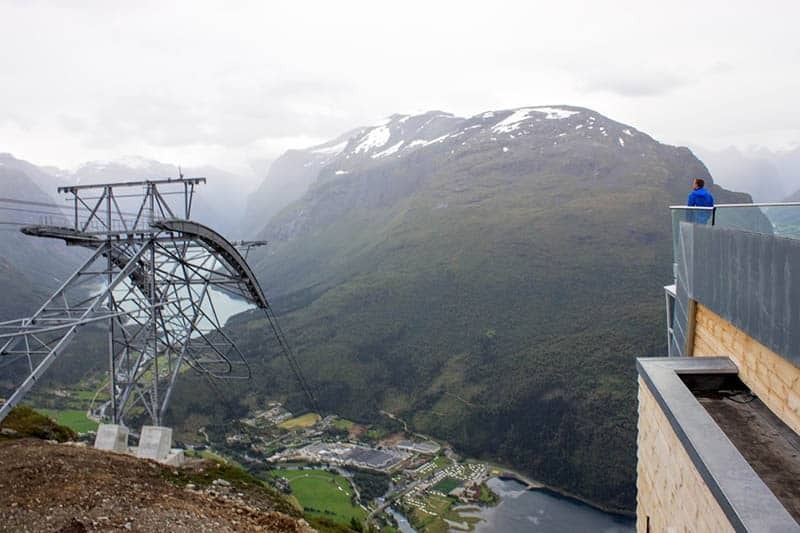 It’s too windy to take the Skylift in Loen, Norway today. I’ll have to come back tomorrow to try again. The Loen Skylift at night. By day, the Skylift rises over 1000m into the sky in five minutes, allowing visitors to view the breathtaking fjord below. Maybe later tonight, even, if the wind calms down. Not the end of the world, I think, as I walk back to my rental car. I’m still in Norway, maybe as I enjoy a beer at the hotel, the wind will die down. The view of the Nordfjord in the town of Loen is pretty spectacular at ground-level, too. It’s been almost a week in the country and I’m still not tired of marveling at the fjords. Just then, Odd-Rune Flo -- the man who’d just suggested that we postpone the tour -- comes running out of the Skylift’s base structure to catch me before I leave. I accept his offer before he finishes the sales pitch. The horseshoe atop Mt. Hoven that acts as a reference and reminder of Norse folklore. He speaks calmly as he guides the 4x4 Mitsubishi pickup through the loose gravel of yet another narrow switchback turn. “…They say as Odin was partway through his long journey, he became, er, excited to see his lover, and kicked his horse to go faster. The horseshoe beneath him carved out this.” He gestures towards the passenger window, where I can look out into the horseshoe-shaped fjord that is coming into view beneath us. As the town of Loen shrinks farther away with each switchback, I can understand why our predecessors imagined epic tales like the one Odd-Rune tells now to describe their surroundings. How else could one attempt to explain the grandeur of nature? Once we reach the top of Mount Hoven (Hoven = Hoof, remember Odin’s horse? ), Odd-Rune and I walk together to the edge of the viewing platform. At this moment, the massive construction efforts and financial investments make sense. I find myself at a complete loss for words. The view of the Nordfjord from Mt. Hoven is the type of panorama that demands a healthy vocabulary of superlatives, not to mention, a professional-grade camera to capture it with. 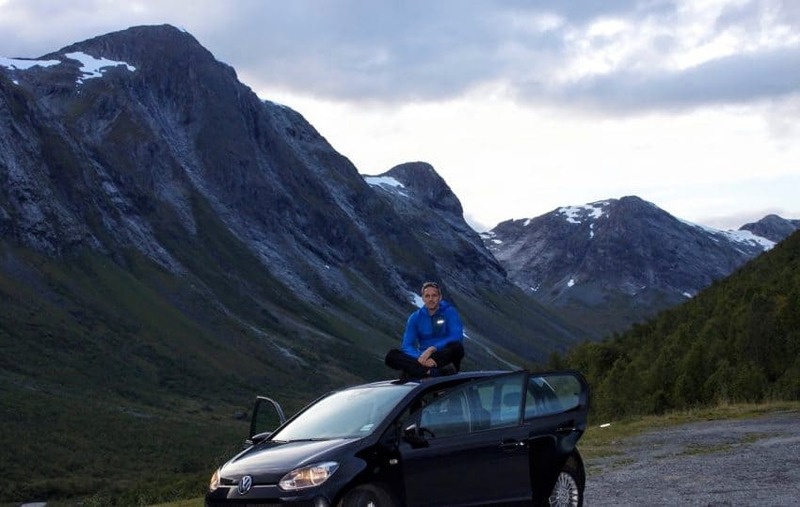 The best way to see Norway - the car. I rented the smallest car they had, and it was the right choice. Luckily, I have no issue finding my camera, if in the moment I cannot find the words. It’s the kind of view that everyone should have the chance to see in their lifetime - this same belief motivates Odd-Rune. “The Skylift was built so that everyone could see this,” says Odd-rune, looking out with me over the vast expanse of blue, grey, and green with an eagerness in his eyes that tells me he’s nowhere close to being sick of the view. Glacial ice is visible in the distance, holding a hue of bright blue that I’ve never seen before. A strong wind blows pellets of rain in my face, yet I refuse to blink, not wanting to miss a moment of the scenery. A truly spectacular view from 1011m above Nordfjord. Since opening in May of this year, the gondola has taken upwards of 75,000 people to this same platform that we stand on now. The wood panels and railings still have a freshly cut look, feel, and smell. 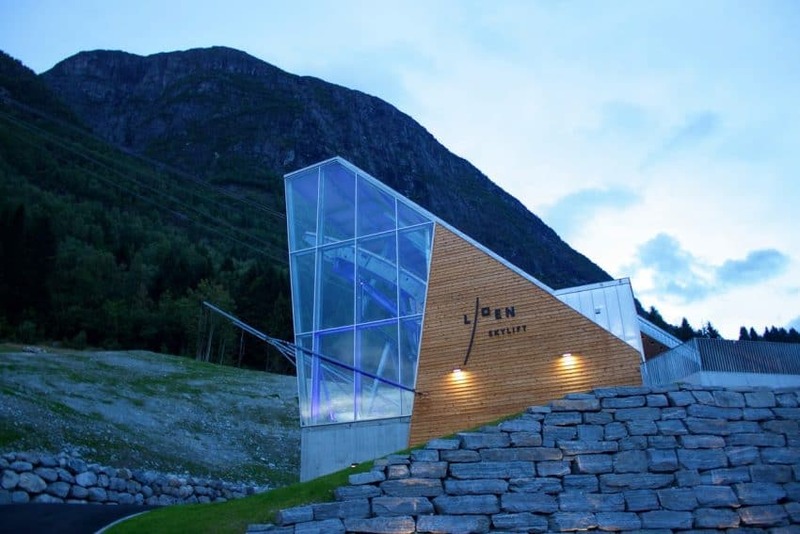 The contemporary, angular design that influences much of modern Norwegian architecture juts from the ancient rock of the mountain like a super-villain’s lair. 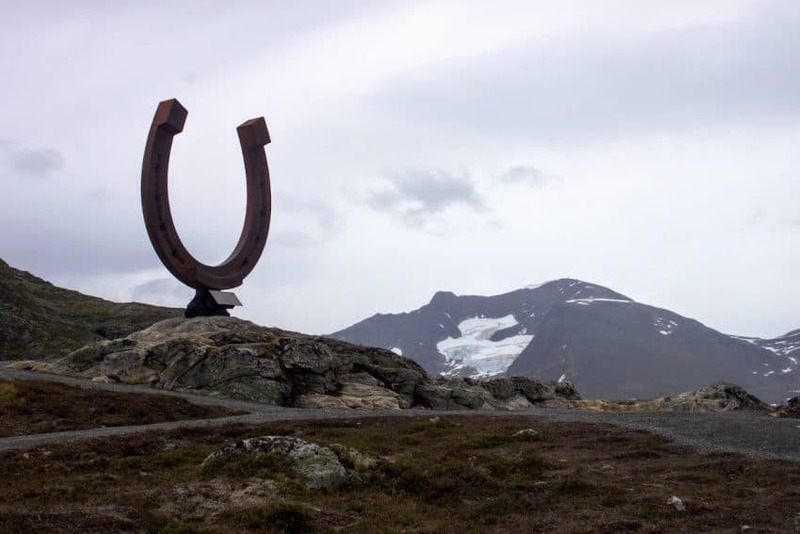 Behind us, a towering horseshoe statue pays homage to the Norse folklore that gave the mountain its name. 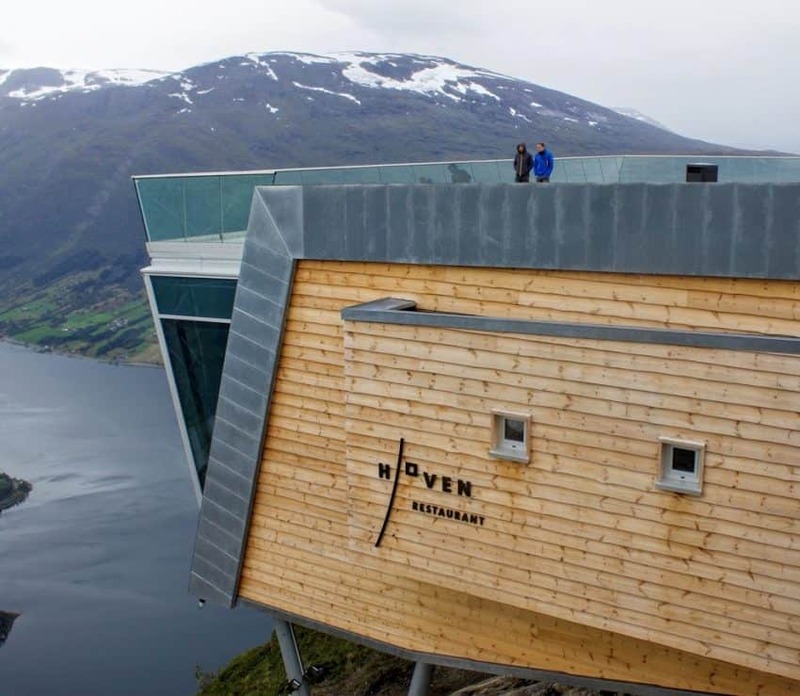 There are hiking and biking trails, evening Northern Lights viewings, as well as a world-class restaurant, aptly named: Hoven, that overlooks the fjord below. You’d be hard-pressed to find a better place to enjoy a steak paired with a local craft beer. There’s something for every taste and, more importantly, for every level of physical ability. Accessibility, Odd-Rune reinforces, is at the core of what brings the team at the Loen Skylift into work every day. “One of the best parts of the job is seeing tears well up in the eyes of our older customers, or those with disabilities… who didn’t think they’d ever get to see something like this,” he said. Odd-Rune and I looking out at the fjord below. The hard work he speaks of is reserved for the builders and workers. As a tourist, it couldn’t be any easier. The entire trip, from base to the top (1,111m) is about five minutes in the gondola. Despite the wind and rain, I stay with Odd-Rune for over an hour, talking about his childhood, and the various types of tourists who now visit Loen and the Skylift. He tells me that the attraction has brought a new vibrancy to the town and that the tourism excitement will continue into the winter months like never before. Currently, the Skylift is being enjoyed by Norwegians more than anyone else, but this gem will not stay secret for long. The Skylift team anticipates their visitation numbers to increase over the next year. Considering the proximity to the already-popular Briksdalbreen Glacier, I’m inclined to agree. When it’s finally time to descend and my feet are back on the sea-level ground, I find myself with a new perspective on my surroundings. My aperture has widened in a way. A new awareness of my insignificance in the face of nature has slipped into my consciousness. I now understand why ancient civilizations carved tales of the gods into stone tablets to describe the world around them. I’m not sure anything short of the supernatural will do the trick for me, either. Jay Fleming is a creative strategist living in Toronto, Ontario. In his spare time, he loves to travel the world and capture his adventures in photographs and words.